jawa von cherié: E.L.F REVIEW/HAUL! 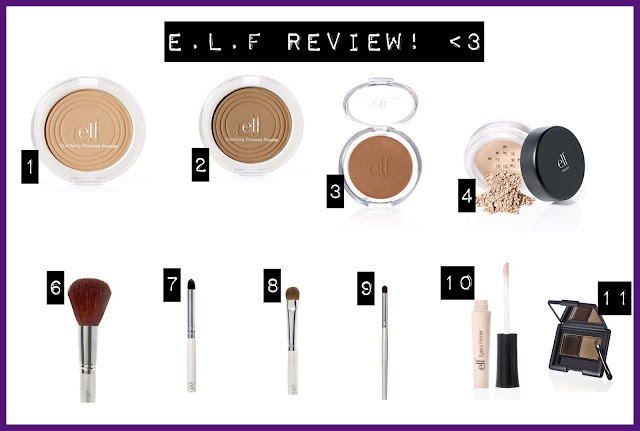 Since I was updating my blog I thought that I could finally do a review of my E.L.F products that I've got ages ago! 1. Clearifying pressed powder in shade Honey: I think this powder was good and very close to my real skin tone, but the downside is that if you are sitting down and putting this on, it will like come off on your pants, so is is quite loose. 2. Clearifying pressed powder in shade toffee: DO NOT use a normal pressed powder with a much darker shade! I wanted to have a tanned look, so I thought that I could use it. But DON'T. It will not look good, you will look like a freak, lol. 3. Healthy glow powder in shade Matte bronzer: I ordered 2 of these since I tested my friends and I LOVED hers. But the thing is I ordered the wrong shade. It is good to use this as a bronzer and conture the face (that's what I use this for) but do not use this all over your face. It will look REALLY dark. I wanted more of a tanned look, wich I've got when I used my friend's one, but I ordered the wrong shade (hate myself for that). Lucky me that is was so cheap. Oh, this one does NOT have any shimmer och glitter, so if you want one with that do NOT take this shade, you will only get dissapointed at yourself (like I did). 4. Mineral booster powder in shade Sheer: I absolutly LOVE this one! I always use it after I've put all my makeup on. It blends in well and it really do give this flawless look. I recommend it strongly! 5/6. (forgot number 5 but it is from number 6 and so on, sorry) Facial brush: I think this brush is great! it feels nice on the skin and it is big, it works really good for the whole entire face. The downsides after a while the brush gets loose from the stick it is on. But otherwise I dont have any problem with this one. 7. Eye smudge sponge: I don't know how this one is actually. I ordered it and never used it so I gave it to my sister. But she likes it, she thinks it is great for the eyebrows! 8. Eyeshadow brush: I really like this brush because it really gets up all the color and you do not have to wash it everytime if you are for example using it to pick up a black eyeshadow and the next day if you pick up a white eyeshadow and put it to the eyelid it doesn't get grey or effect the other color! So that is so cool. 9. Eye crease brush: This brush doesn't really pick up the color and this is not a favorite to be honest.. But I use it for blending to give it a smoother look so it doesn't look to harsh. It works great for that! 10. Eyelid primer in shade Sheer: THIS IS THE BEST EYELID PRIMER I HAVE EVER HAD!! This one is soo good. It doesn't feel heavy or greasy on the eyelids. You barerly feel it at all. It keeps your eyeshadow on place and it lasts THE WHOLE DAY, even after you have worked out. I spend over 40 euro on a proffesional eyelid primer and I spend 1,5 euro on this one and it OWNS the proffesional one! 11. Eyebrow shadow/gel in shade Ash: I ordered the wrong shade. I accidently ordered the lightest one and I got BLACK eyebrows.. But I liked the gel and the brush that I've got it with. The eyebrow gel keeps them in place and honestly, I do not have anything bad to say about this product. I forgot to put the Lock mist Spray. But I do a review on it anyway. I spray it all over the face, and I do it when I am COMPLETLY done with my makeup. It is good, but it doesn't really keep your makeup all day.. Sometimes it kinda disappears even FASTER! But is is perhaps maybe I think so..
Over all, I am happy with the E.L.F products, I might even to a makeup tutorial with the products. Hope you liked the review and I hope this one is helpful to you guys! Movie time with Johnny Depp! So much things to do! New design and new header! Pictures that I promised to upload ages ago!